How can a city’s passion for “Play” transform a community gaming experience? 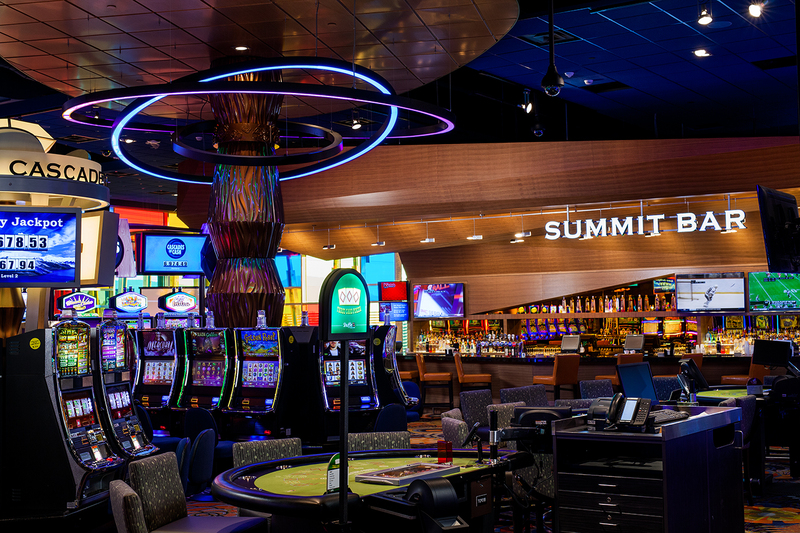 55,000 sq ft of entertainment and gaming areas, with the gaming floor incorporating 500 slots and 20 tables with varied hospitality spaces including 2 bars, a lounge, raised stage, 2 patios, and a poker mezzanine with a luxury salon privé. 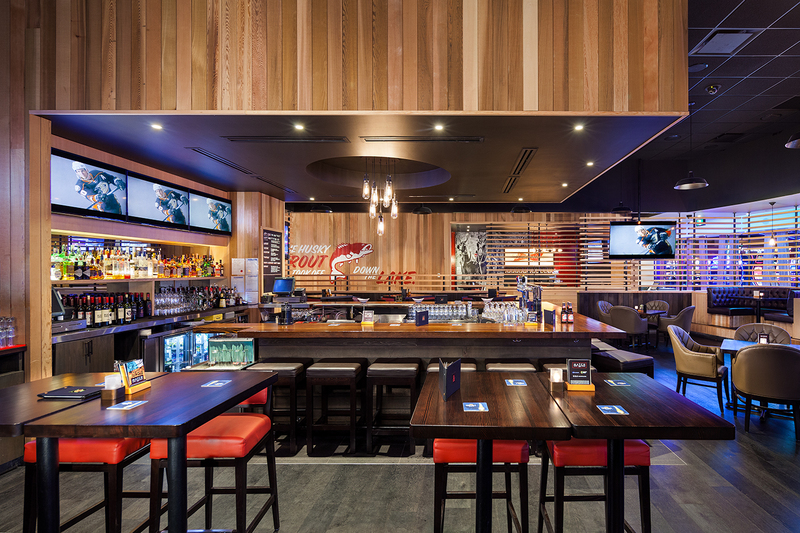 Three full service restaurants with patio – the high-end restaurant, the buffet and the sports bar. Public circulation, washrooms and various other amenities. 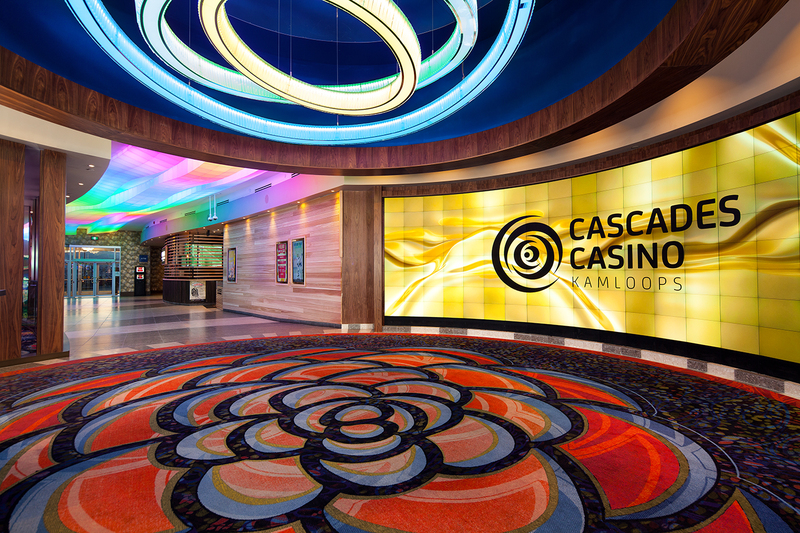 The new Cascades Casino is located in the semi arid foothills of the Coastal Mountain Range in Kamloops, British Columbia. The region is home to an incredibly diverse landscape of sagebrush-covered hills, ravines, wide-open grasslands, rugged mountains, forested valleys and pristine lakes. The city has become synonymous with play, adventure and a year-round haven for adrenaline enthusiasts who seek blue skies, gnarly cliff faces and winter’s famous dry powder. The creative team was instantly inspired by the vast beauty of the locale and deeply influenced by the passion that the people of Kamloops have for living fully and completely in a landscape that defines their unique sense of “place” in the world. This inspired the development of a bold design vocabulary that explored an interesting array of natural textures, patterns, colours, geometries and scale. Our experiential strategy obsessed over spatial ideas such as movement, path, intersections, thresholds, transparency and vista. The word Kamloops derives from the Secwepemc word “Tk’emlups”, meaning “where the rivers meet”, in this case referring to the North and South Thompson rivers. Designed as a series of flowing experiences, the guest first arrives into a dynamic interior space that features a colour changing light ribbon on the ceiling. 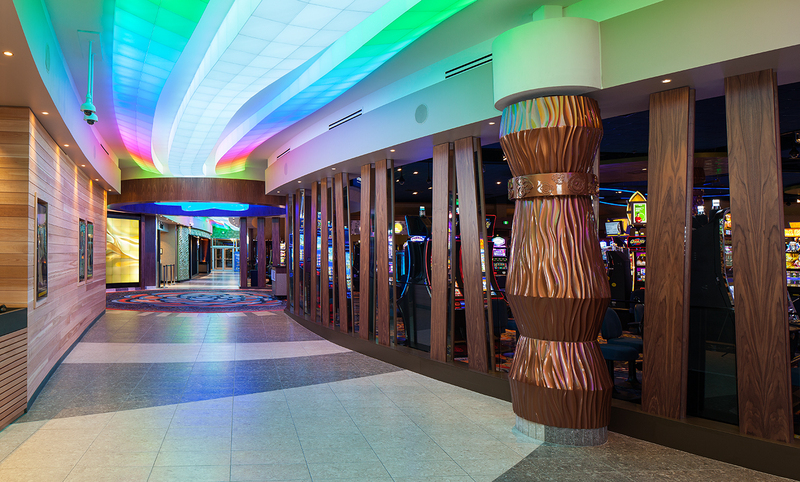 Its iridescent glow, slowly ebbs towards the central hub and gaming floor entrance. The hub is home to a state of the art interactive video wall that invites guests to play with pre programmed visuals on the screen that respond to their engagement of the space. It also naturally provides the operation with a marketing and communication opportunity. 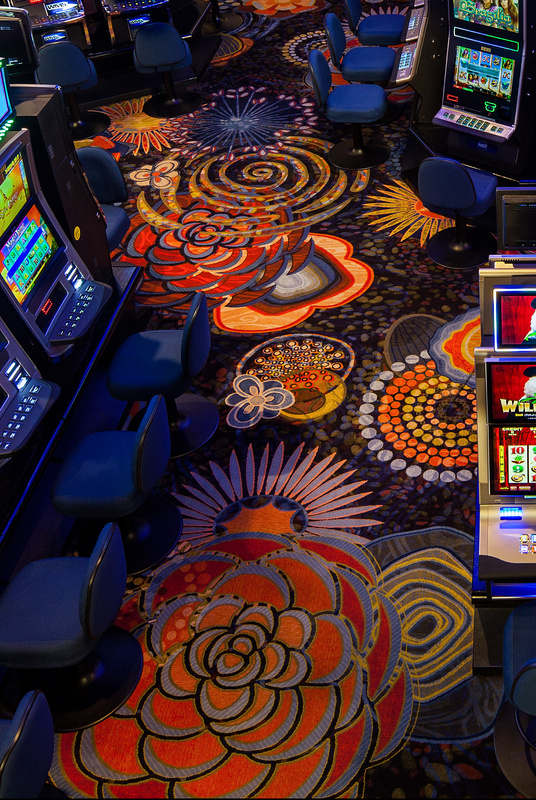 The gaming floor features 500 slot machines and 20 table games, complete with a Poker Room and Salon Privé which is located on the second floor. 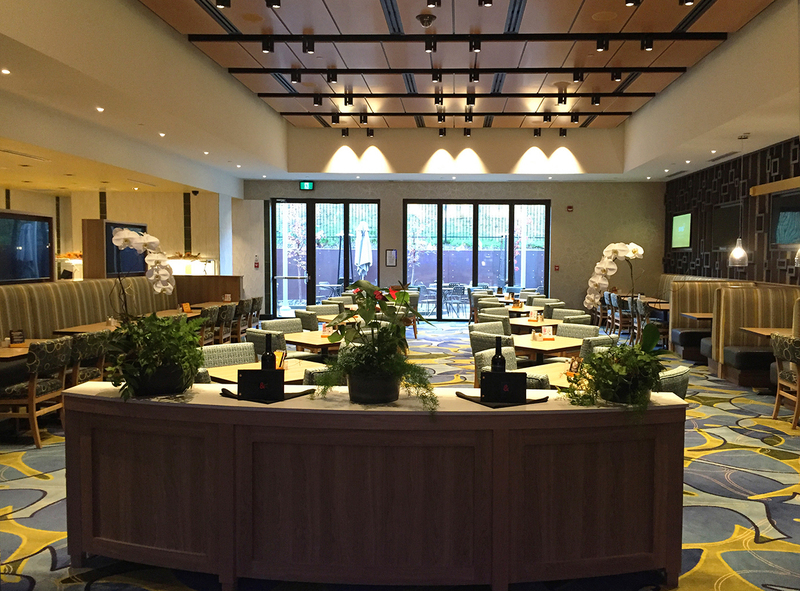 The faceted Summit Bar includes a raised entertainment stage and patio. The custom carpet designed by mackaywong’s Branding studio features highly stylized wildflower patterns inspired by the local flora and fauna. 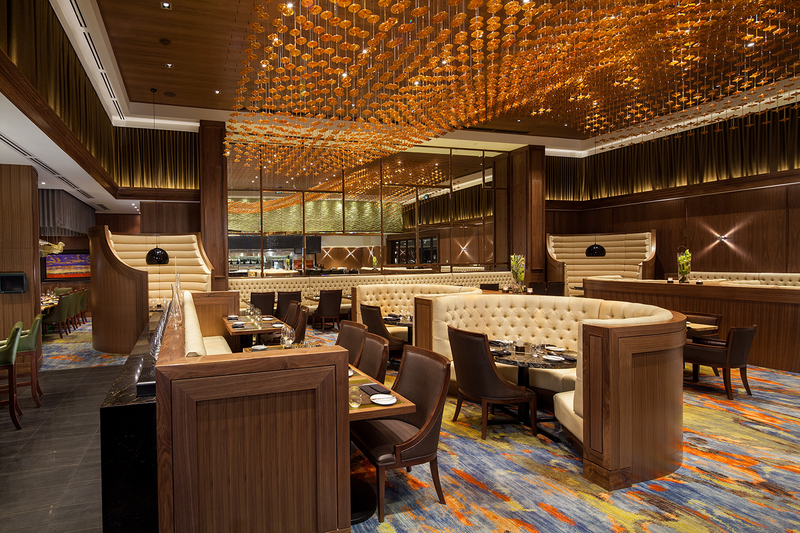 Cascade guests enjoy a lavish meal at Atlas Steak + Fish. 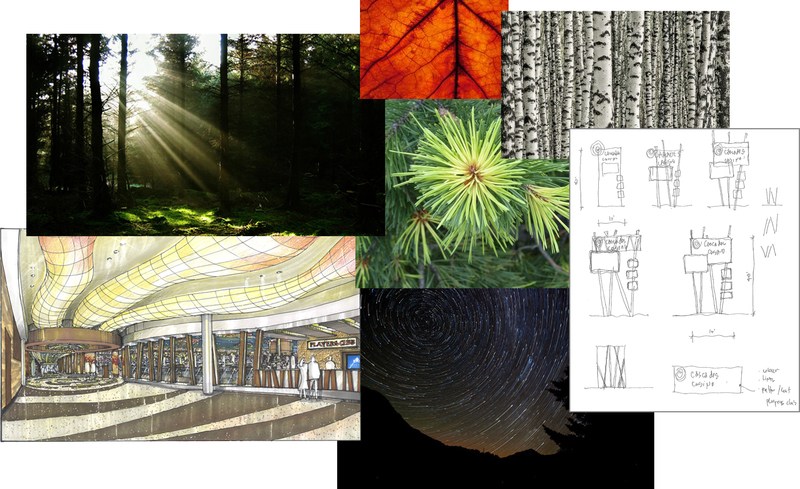 The design concept builds on the properties nature inspired themes. 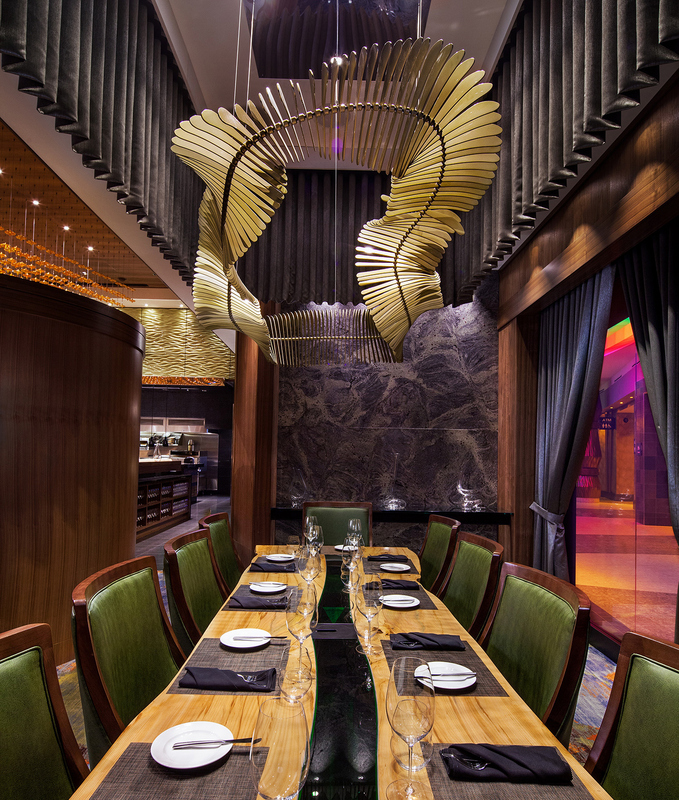 Elements of earth, fire, water and sky are artfully composed to create a rich, dramatic, and multi-layered dining experience. Located off the interior street, The Buffet Restaurant presents a fresh, open and contemporary environment for guests to enjoy a quick market styled dining experience. 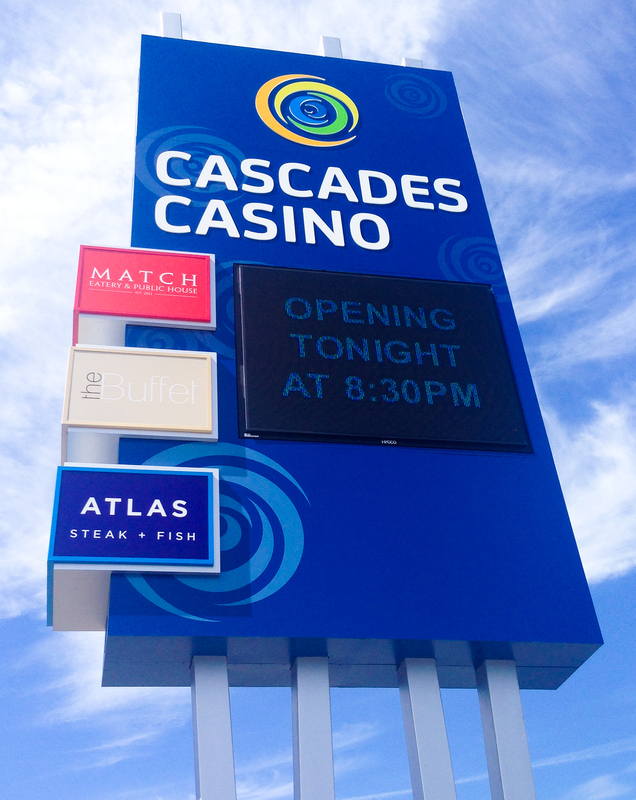 As their signature “local” concept, The Match restaurant concept was developed by Gateway Gaming and Entertainment. 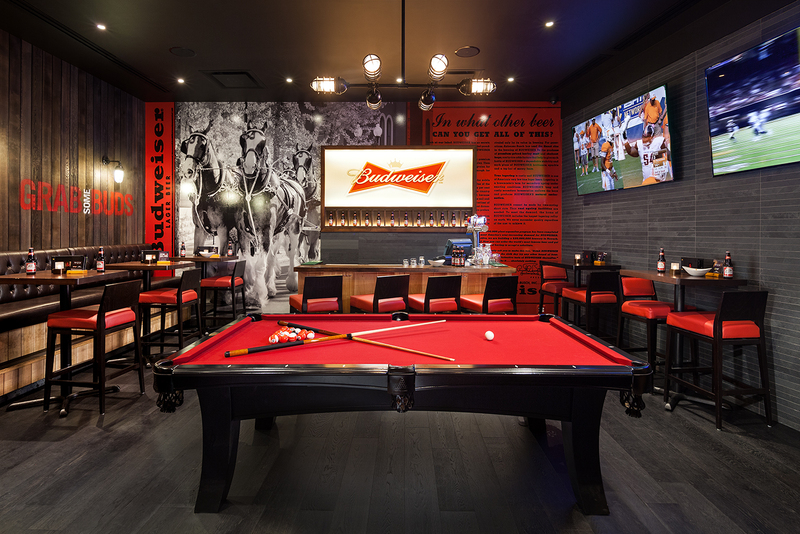 The pub styled interior features a relaxed vibe infused with a sportsman flair. 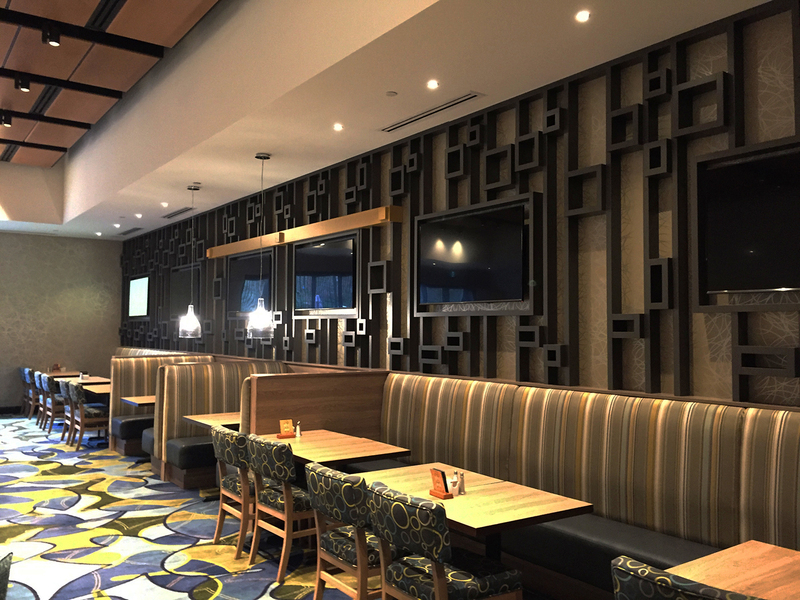 Clean lines and natural materials such as cedar, slate and leather create a contemporary interior, which work cohesively with all exterior signage. 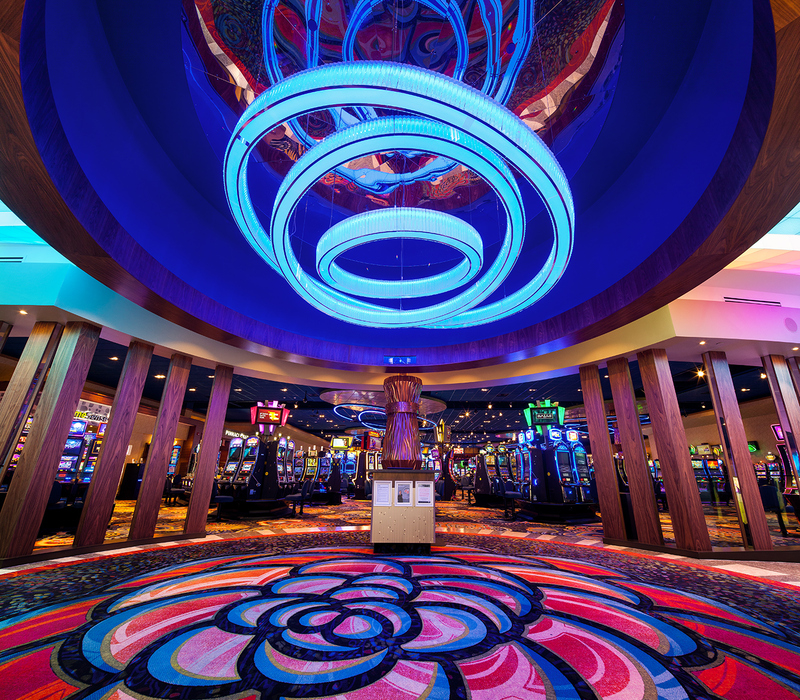 The design strategy for the casino’s logo and its restaurants were developed creatively to reflect the experiential themes of Play, Nature and Community.